Unfortunately, too many kids are not getting to school and back safety. In fact, every day in the U.S. more than 40 kids are hit by a vehicle while walking. That’s more than 15,000 children injured each year. So let’s work together to do something about these preventable tragedies. When you talk to your children about everything that goes with their return to school, from teachers to friends to homework, please also talk to them about how to walk there safely. 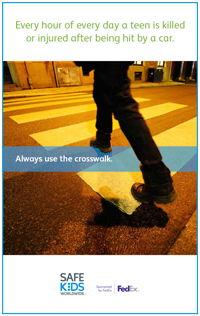 This goes double for those of you with teenagers, since they are now the most at-risk youth for pedestrian injuries. Here are some tips and resources to help start the discussion. Be an advocate for pedestrian safety with our Take Action Toolkit: How to Fix Unsafe School Zones. 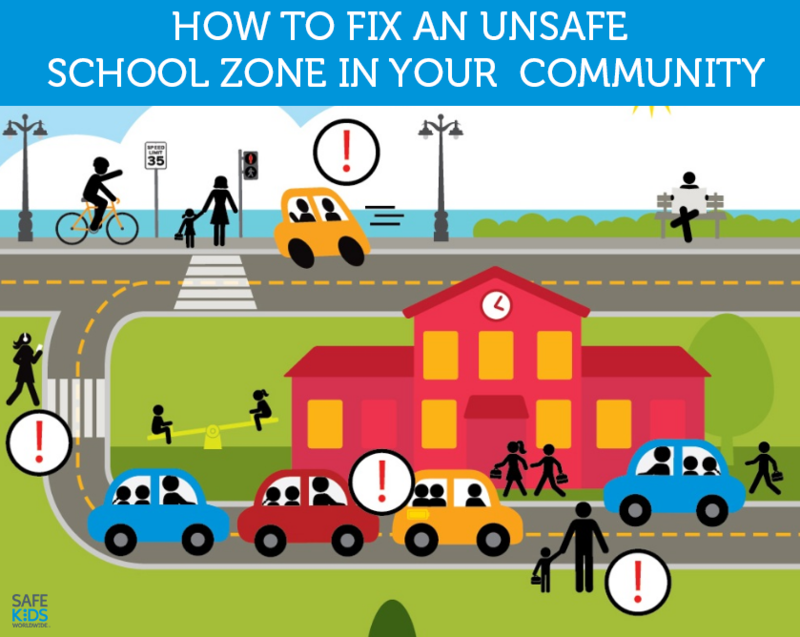 If you observe speeding or other dangerous behaviors in your school zone, use these tips and resources to help take that one step further to make your neighborhoods safer. 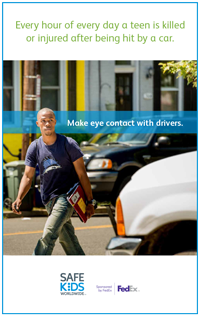 This toolkit was developed by Safe Kids with support from FedEx, to empower parents and caregivers to make policy or infrastructure changes that improve safety for pedestrians, bike riders and all of us near schools. 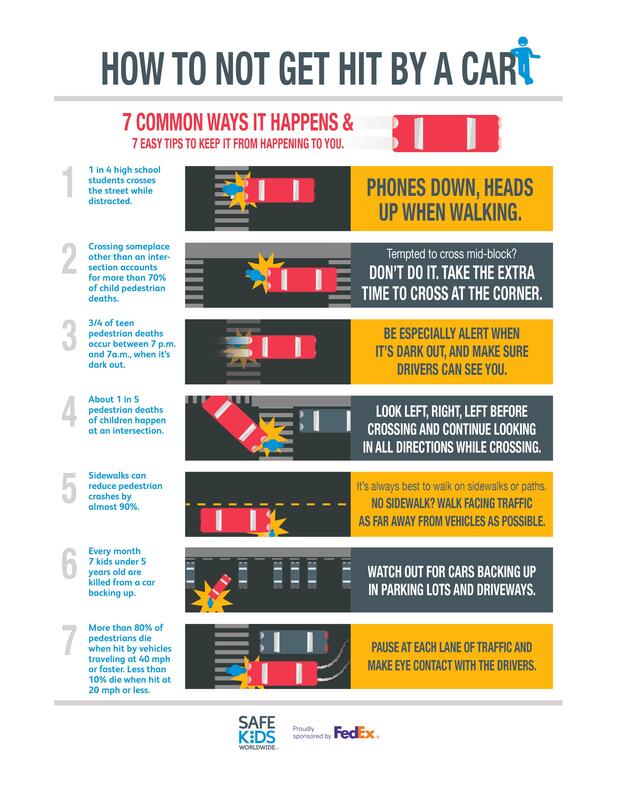 This infographic highlights seven ways children are getting hit, paired with seven tips to prevent them from happening. Join in and help teach kids how to be safe while walking. 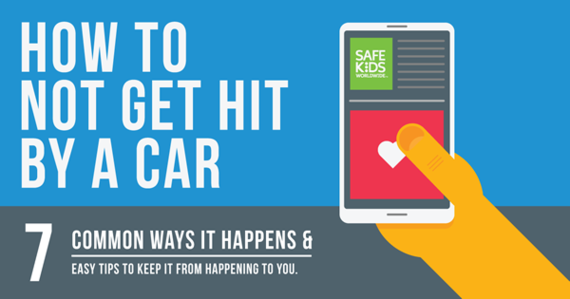 We’ve created some posters that you can use in your community or your child’s school to help spread awareness of common ways kids get hit by cars. One of the common distractions of older children and teens is technology. We know that teens have been told over and over again how dangerous it is to walk, or drive, while distracted. But the statistics prove that they still do it. Don’t believe it? 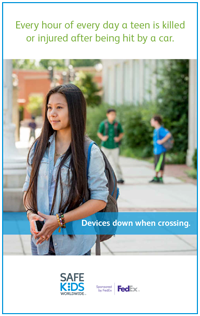 Watch this video as our own Gary Karton stops teens on the street of Washington, D.C. to ask them about distracted walking. We hope your kids have an exciting and safe school year.